"Texas wedge" is a golf slang term for the putter or for any shot from off the green that the golfer chooses to play using a putter. We'll explain how the term "Texas wedge" originated below, but first some words about why using a putter from off the green is sometimes the right play. 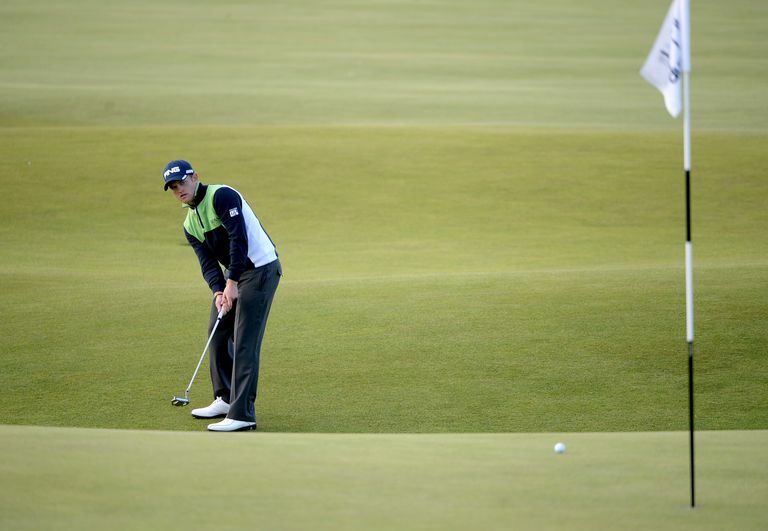 Another way to put it: Keeping the ball on the ground with a putt from off the green reduces the risk involved. Your margin of error is greater. Of course, you have to have to the right conditions to play a Texas wedge shot: firm ground between you and the putting surface; no hazards, rough, fluffy fairway grass or other problems between you and the green. The farther you are off the green, the harder, more closely mown you'll want the turf to be before choosing the putter option. If the grass is lush and soft, you'll have to consider chipping, pitching or even a lob shot. If there is thick rough ringing the green, or there is a bunker or some other problem area between you and the green, that removes putting from your list of options. Likewise, if putting from off the green requires putting through fringe whose grain is growing against you ( you'd be putting into the grain) you're probably better off chipping. In that scenario, judging the correct speed is very difficult. Where Does the Term &apos;Texas Wedge&apos; Come From? Texas, of course! It's believed that the term was popularized by that greatest of all Texas golfers, Ben Hogan. Back in Hogan's day and earlier, many Texas golf courses, especially those outside the biggest cities, were noted for very dry, hard conditions. Fairway grass could be thin and very tightly mowed (if it was even growing), fairways hard, little to no rough and winds high. Many Texas courses had push-up greens. Chipping or pitching from 20, 30, 50 feet off the green, from very tight lies to small, domed greens, and in plenty of wind, was a challenge, even for very good golfers. So golfers in that circumstance developed an alternative: They pulled out the putter and rapped the ball up to the green on the ground. The Texas wedge. Are Texas Wedges Still Played Today? You bet! Anytime a golfer putts from off the green, you might hear it called a "Texas wedge," even when conditions otherwise don't much resemble those long-ago Texas golf courses where the term arose. Golf courses today where conditions often do resemble the original Texas wedge courses are the links courses of the United Kingdom. Texas wedge shots are played often every year at British Opens. If you choose to play the Texas wedge shot, you'll need to take into account the slope of both the fairway and green, just as you would if you were reading break on a normal putt. Alternate uses: Note that the term "Texas Wedge" has been used by many golf companies over the years as the brand name on putters, chippers and wedges. Also some golfers, even some instructors, use "Texas wedge" either as a synonym for a bump-and-run chip or to mean blading the ball with the leading edge of wedge from around the green. Those uses are out there, but they are less common than using "Texas wedge" to mean the putter and a stroke from off the green, its original meaning.